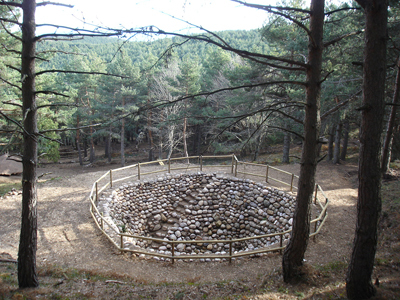 In the middle of a pine forest on the summit of Moncalvillo lies an ice treasure. 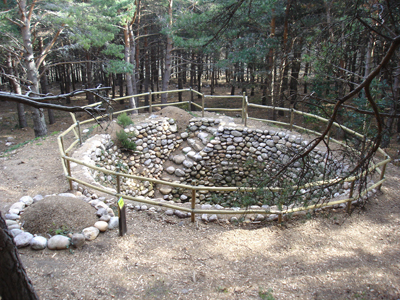 We are talking about an Ecomuseum in the mountainswhere five snow wells were built at the end of the 16th century to supply ice to the city of Logroño. A history of snow and ice that you can discover at the new Centro de Interpretación de la Casa de la Nieve de Moncalvillo, Visitors' Centre at the Sojuela Town Hall. To see these snow wells, you have to follow a signposted footpath, for more than 2 hours, until you reach the altitude of 1,400 metres. For those just wanting to take a stroll through a landscape of forests and traditions around Sojuela, there are other easier trails. - Literature on snow wells, traditional dry stone architecture, traditional uses of ice. 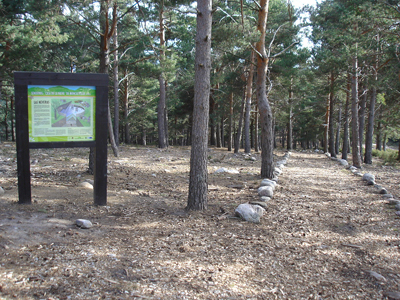 Information and interpretation panels on glacial landscape and the chronology of the cold, Mesta and transhumance landscapes, and Sierra de Moncalvillo landscapes. Visiting Hours: Saturday to Wednesday from 10.00 to 14.00. Thursday and Friday closed. Visits arranged for groups of 24 maximum.